I have a distinct memory of the first time I heard of a band called REM. It was a Saturday morning in 1984, and I was standing around with some friends after a youth league soccer game. One of my buddies who had an older brother said that he was going to a college (!) concert that night to hear a band called REM. In any case, after that one episode, REM slipped from my consciousness for a few years, until my sophomore year of high school. That previous summer, Life’s Rich Pageant had been released, and during the waning days of summer and the first days of autumn, my friends and I listened to that cassette tape non-stop. From the opening riff of “Begin the Begin,” I was hooked, transfixed by a sound that was addictive and unlike anything I had ever heard. Now, for context, I was a relative novice, music-wise. My listening experience had been limited to listening to my parents’ record albums (ranging from The Beatles to Flatt & Scruggs, Scott Joplin to Mussorgsky . . . great, eclectic, quality stuff, yes, but The Ramones and Velvet Underground, they were not) as a kid to the stuff popular at middle school dances (think Journey and “Oh, Mickey, you’re so fine…”). REM spoke to me, spoke to us, in a way that Morrissey and The Smiths have spoken to teenage angst across the decades. A blogger for the New York Times Magazine has described this sound as “mysterious, self-effacing, earnest, hopeful, yearning, humble.” Yes, exactly. To me, that album remains REM’s quintessential work—because it was the album that introduced me to them, to a world I had never laid eyes (or ears) on before. 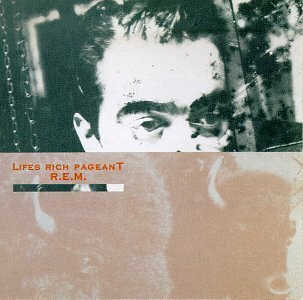 And while I would come to appreciate other albums more (Murmur and Reckoning, the band’s first two releases, became the “classic” REM albums in my eyes, the ones every aficiondo appreciated best) Life’s Rich Pageant was the gateway drug, the album that screams “REM” to me more than any other. Yet, with all that said, it was their first commercial hit, their first album to go platinum, that still delivers the strongest emotional wallop. The release of Document coincided with the clichéd but oh-so-real coming-of-age year. It was the year of driving, of going on real dates, of going to parties and all that entailed—under-aged drinking, parents out of town. It was the year a friend attempted suicide at one of those “home alone” parties. With the announcement that REM is no longer, it prompts flashes of all these emotions—discovery, exuberance, possibility, young love, young heartbreak, even shock and horror. When I was in college, I used to see Michael Stipe from time to time. He was (and I presume still is) friends with the artist Sally Mann, who lives in the town where I grew up and went to school. For a year or so, I had seen him around—walking down the street, driving in a car—but I never had the occasion to speak to him until I literally bumped into him at a big college party called Fancy Dress. I apologized before I even realized who he was; in my hazy recollection I believe I spilled a drink on him. And then I noticed that Sally, who I’ve known since I was a child, was the companion of this slight, bald, and, for W&L, unconventionally dressed guy who happened to be Michael Stipe. I think I mumbled something to him, some platitude about how I loved his music, and that was that. Looking back, I can’t imagine anything else I would have said or done at that time. But now, with the benefit of hindsight and wisdom and sentimentality–age and time, really—I think it’s appropriate to offer a word of gratitude, of thanks, to not just Sipe, but Peter Buck and Mike Mills and Bill Berry. Thanks, not just for the memories, but for making the memories what they are. This entry was posted in Midd Blogosphere, music and tagged Uncategorized on November 11, 2011 by Matthew Jennings. Well, I’ll tell you. It has to do with being a fan, specifically how being a fan of something or someone when you are a kid is impossible to replicate in adulthood. 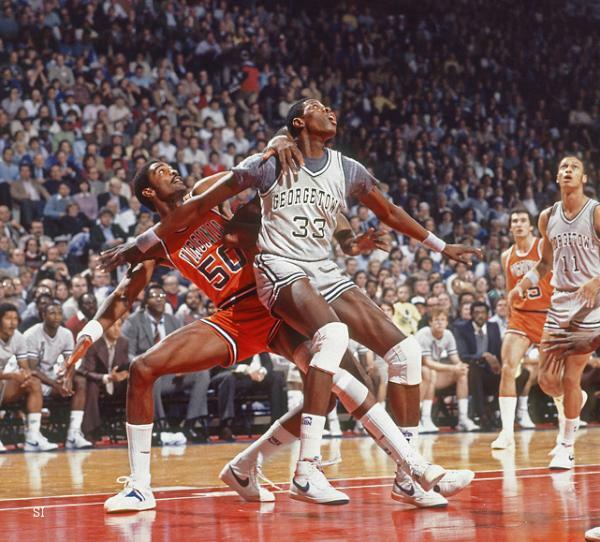 As soon as I saw this image of Ralph battling with Patrick Ewing under the basket in what was then called “The Game of the Century,” I was hit with a wave of emotion that is near impossible to describe. Seeing that uniform, and not just that uniform but that uniform in that particular moment, frozen in time, made me feel for a nanosecond like I was 12 again, and there was no more important thing in my orbit than the fate of the UVA basketball team. And then the feeling faded, like a wisp of steam evaporating in the air. Had I been a music nerd rather than a sports nerd at that time, I imagine that I’d have a similar reaction to artists who I first heard as a young adolescent, when one’s love for something is unencumbered by, well, real life. As it is, I still have visceral reactions to albums that I remember my parents playing at that time (The Beatles’ “Abby Road” and Lester Flatt’s and Earl Scruggs’ “Nashville Airplane” are at the top of the list), but the feeling is not as intense as it would be if I had wanted to be a musician or a music journalist. So, what about you? What takes you back to adolescence and makes you feel like a kid again? This entry was posted in Midd Blogosphere, music and tagged Uncategorized on October 6, 2011 by Matthew Jennings. These guys made a big splash in 2005 with their self-produced, self-released eponymous album (that was really quite, quite good), followed that with a mediocre second album a few years later, and have now atoned for their sophomore slump with this infectious, shimmery release. Yes, this album sounds like just about everything else these guys have done, but that’s not necessarily bad, is it? Melodic, eclectic poppy fun. I mean, why not? Two of the masters jamming together…what’s not to like? Ok, I need to explain this one. I don’t really care for Tony Bennett (I’m a Sinatra guy) and I’m usually suspicious of these duet efforts (unless it’s, like, Armstrong and Fitzgerald), but after reading Gay Talese’s profile of Bennett in the New Yorker, I was intrigued enough to sample a track on iTunes, and damn if I wasn’t impressed with Bennett and Lady GaGa’s version of “The Lady Is A Tramp.” Out of pure snobbery, I had never listened to Lady GaGa before, but she can sing, really sing, and you can tell that she and Bennett hit it off. (And this was the subject of Talese’s piece.) Now, I’m not sure the entire album, is worth a buy recommendation, but this track certainly is. This entry was posted in Midd Blogosphere, music and tagged Uncategorized on October 5, 2011 by Matthew Jennings.